This is a no brainer. Identifying support and resistance levels is one of the first things you learn in technical analysis. It is the most important aspect of chart reading. But, how many traders really pay attention to it? Not many. Most are too busy looking at Stochastics, MACD, and other nonsense. Some traders think that a support or resistance level is a specific price. Wrong. It's an area on a stock chart. Let me give you an example. The areas that I have highlighted are the correct support and resistance levels. 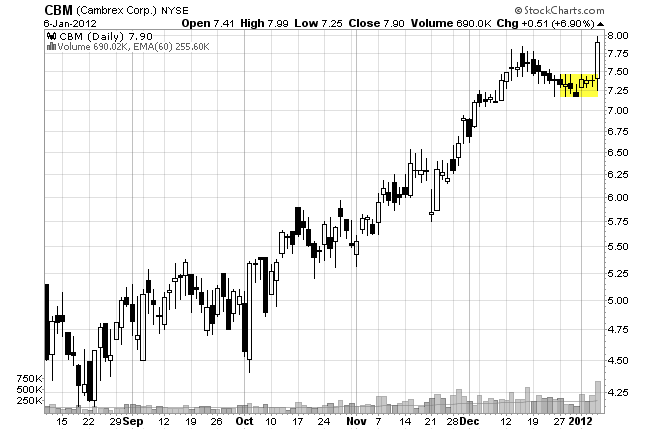 Often times you will hear traders say something like this: "The support level for XYZ stock is $28.76." This is wrong. It's an area - not a specific price. Look at the area that I have highlighted in green. You may have considered buying this pullback. Now look at the prior swing point high (yellow highlighted). 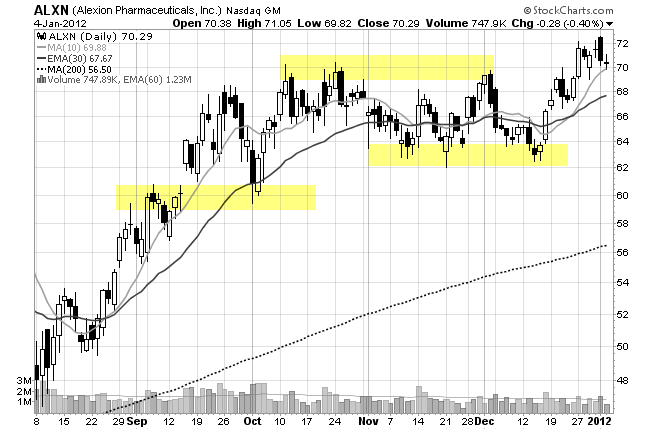 There are two problems with buying this pullback. First, there isn't much room to work with! The distance between the pullback and the prior high is too small. You need more room to run so that you can at least get your stop to break even. The second problem is this: The prior high (yellow area) is composed of a cluster of candles. This is a strong resistance area! So, it will be very difficult for a stock to break through this area. Instead, look to trade pullbacks where the prior high is only composed of one or two candles. This stock was moving lower in October (highlighted) and then suddenly it dropped more significantly than on previous days. This created the wide range candle and it marked an important turning point (actually the bottom!). This stock reversed inside of prior wide range candles. Why would a stock do this? Because all of the traders that missed out on "the big move" now have a second chance to get in. This buying pressure causes the reversal. Simple, huh? Narrow range candles can also tell you that a reversal is imminent. This low volatility environment can lead to explosive moves. Narrow range candles tell you that the previous momentum has slowed down. Buyers and sellers are in equilibrium but eventually one of them will take control of the stock! On candlestick charts, lower or upper shadows on candles usually means that there is a hammer candlestick pattern or a shooting star candlestick pattern (if the shadow is long enough). Regardless of the name, these shadows mean one thing: A price level has been rejected. Imagine what this hammer candle looked like during the day (before it became a hammer). It was really bearish! But, at some point during the day, the bulls rejected the lower price level. I can imagine the bulls saying, "Hey wait a just a second. You bears have taken this too far. This stock is worth much more than the price that you moved it to." How can you tell if a candle is significant? Easy. Look to see how far it has moved into the prior days range. If it moves at least 50% into the prior days range, then it is significant. And, it is especially significant if it closes at least 50% into the prior days range. 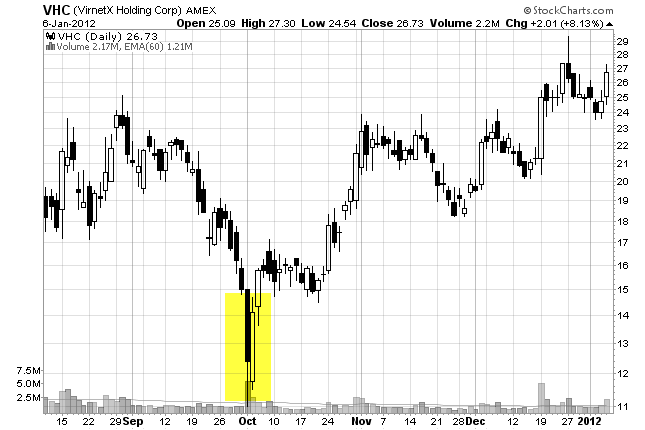 This usually shows up on the stock chart as a piercing candlestick pattern or an engulfing candlestick pattern. All of the important reversals in this stock happened only after a candle moved at least 50% into the prior days range (some moved much more than 50%). This concept is so powerful that I am suspicious of buying any pullback unless it moves at least 50% into the prior days range. You can probably see what is happening here. The stock gaps down at the open. Everyone thinks this stock is going to tank. But it doesn't! Buyers come in and move this stock right back up. 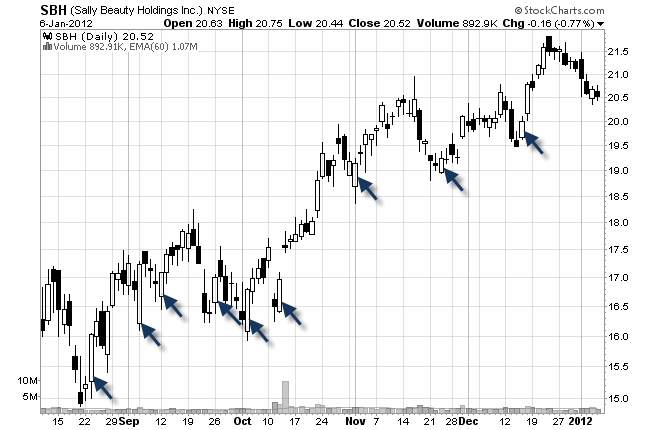 You can look at one of these candles and almost see all of the confused faces on other stock traders! 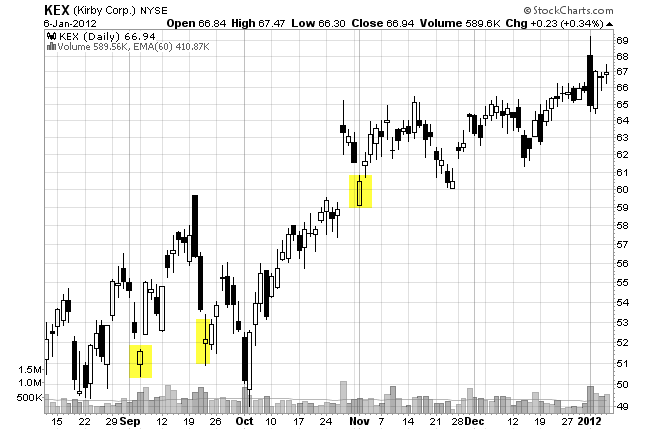 The price action moved about halfway down (arrow) into the prior swing (dotted line). This is good. If it retraced more than that, you may want to question the validity of the move. 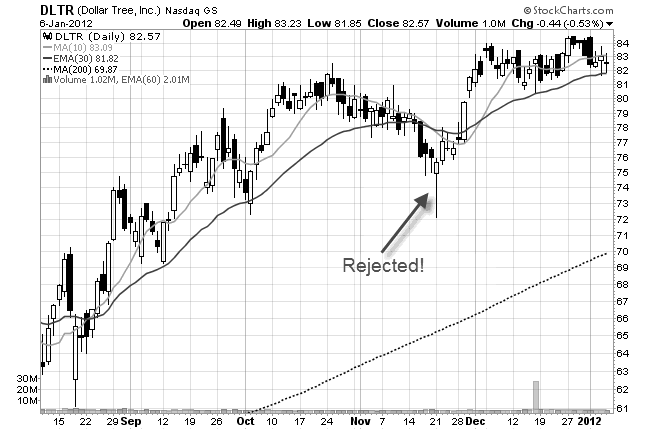 This is because a stock in a strong trend should not retrace more than halfway into a prior swing. It should encounter buying pressure sooner than the half way mark. And many times stocks will reverse right at the halfway mark. 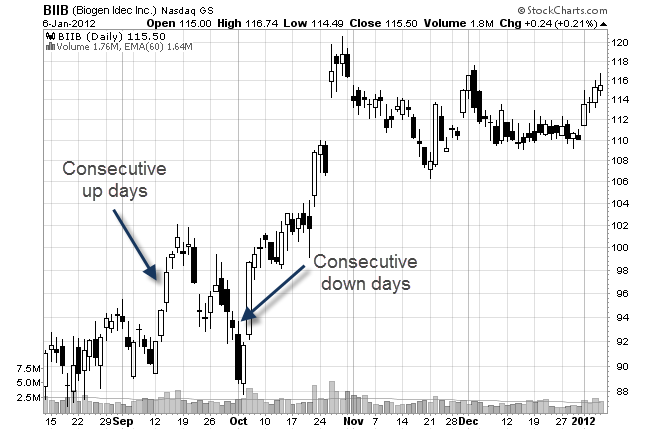 You should always look to short a stock after consecutive up days. And, you should look to buy a stock after consecutive down days. This is counter intuitive for new traders because they tend to associate a stock going down as "bad" (meaning sell) and a stock going up as "good" (meaning buy). In fact, it is just the opposite! 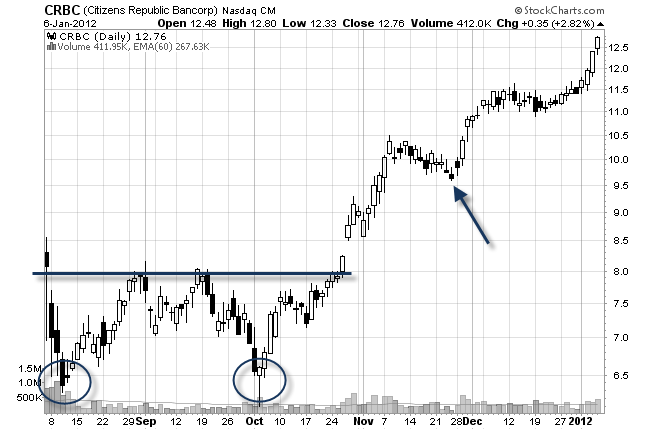 This stock broke out (horizontal line) from a double bottom (circled). A new trend has begun. 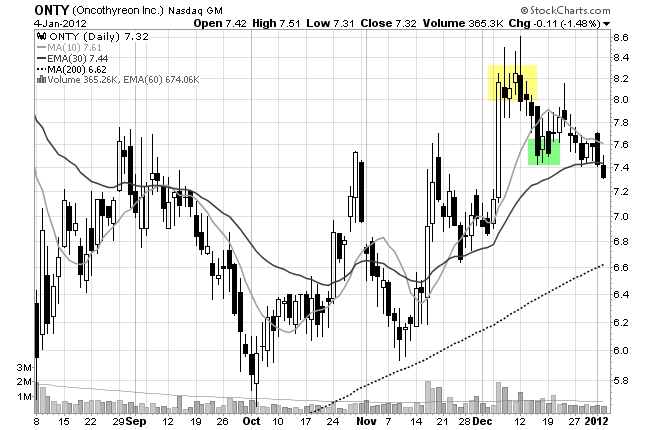 So, you want to buy this stock on the first pullback (arrow) after the breakout. So, there you have it. 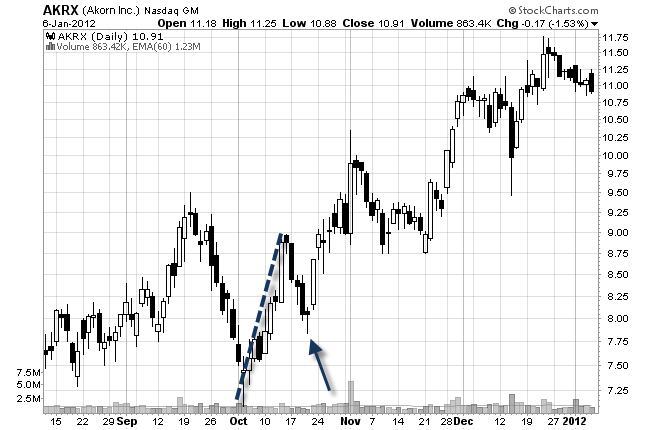 These price action tips and tricks will make you money in the stock market. You can use this information to make your own trading strategies and systems. Best of all, once you master this art, you will never have to rely on technical indicators again to make trading decisions.